Chhattisgarh Chief Minister Bhupesh Baghel will expand his Cabinet on December 25. At least ten MLAs are likely to be administered the oath by Governor Anandiben Patel at Raj Bhavan on that day. 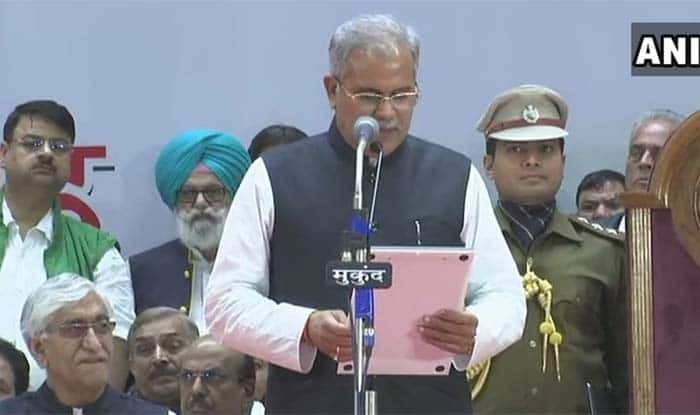 Raipur: Chhattisgarh Chief Minister Bhupesh Baghel will expand his Cabinet on December 25. At least ten MLAs are likely to be administered the oath by Governor Anandiben Patel at Raj Bhavan on that day. Two ministers – TS Singh Deo and Tamradhwaj Sahu – had taken oath on December 17. The Cabinet can have 13 ministers at most, including the chief minister. The state has 90 assembly seats. The development comes a day after Baghel, along with state leaders of his party, met Congress chief Rahul Gandhi in Delhi and finalised names of ministers. “The party has tried to give representation to leaders from all the communities in the Cabinet. Almost all the senior leaders have been covered. Besides 11 Lok Sabha constituencies are also kept in mind in view of 2019 elections while finalising the Cabinet”, a party leader was quoted as saying in a PTI report. A senior official at the Governor House has reportedly confirmed that the ceremony will take place at 11 am on Tuesday. Portfolios of the ministers will be decided after the oath-taking ceremony. One of the runner ups for the chief minister post, former union minister Charandas Mahant, four-time MLA Mohammad Akbar, former minister and OBC heavyweight Dhanendra Sahu, senior leader and former Leader of Opposition Ravindra Choubey, former minister Satyanaryan Sharma, among others are key contenders for the Cabinet berths. Furthermore, it is reported that the choice of a minister from Scheduled Caste (SC) community would be between State Congress Working President Shiv Kumar Daharia and Rudra Guru. Congress registered a landslide victory in recently-held Chhattisgarh Assembly Elections 2018 by bagging 68 seats in 90 member assembly. The BJP, which was in power in the state since 2003, won only 15 seats.